A sugar cube soaked in bitters, a shot of whiskey, and an orange peel; creating an impressive and timeless cocktail really is that easy. The drink is the Old-Fashioned, and it is one of the best ways to enjoy your favorite bourbon or rye whiskey. 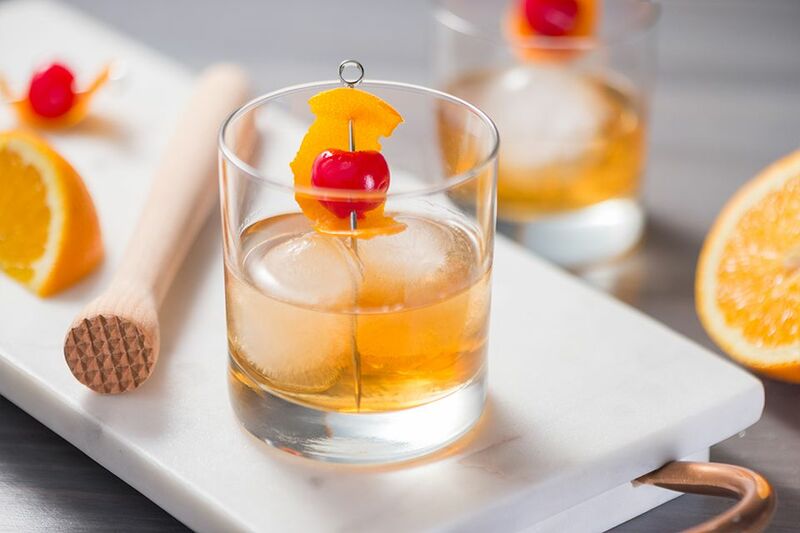 The Old-Fashioned is a classic whiskey cocktail that has been served since the mid-1800's. The Old-Fashioned is a fantastic way to dress up a glass of whiskey. If you're a traditionalist, choose a great rye whiskey, but know that bourbon is a perfect choice as well. The sweet, bitter, and fruit flavors added to the glass will enhance any whiskey you pour. Place the sugar cube at the bottom of an old-fashioned glass. Saturate the cube with bitters and muddle. Fill the glass with ice (the larger the cubes, the better). Add the whiskey and stir well. Garnish with an orange peel and cherry. Looking for something that's more effervescent? Top off the drink with a splash of club soda. Muddle a whole orange slice with the bitters-soaked sugar cube, for a more intense citrus flavor. It's common for drinks to morph and evolve over the years. This is especially true when we're talking about one of the very first cocktails and today there are many variations on the old-fashioned. Rye whiskey was the original choice for the old-fashioned. Over the years, the selection of good ryes dwindled so bourbon became the go-to substitute. While bourbon remains a favorite for many drinkers, we also have the luxury of a burgeoning rye market. It's difficult to choose a bad whiskey for this drink and it's a great venue to try out new finds, so pour whatever you like. Quite often, bartenders will top the drink with a splash of club soda. That is not a traditional method and old-timers would certainly scoff at its use. Even the maraschino cherry is not original and, honestly, it's not necessary for anything other than making the drink look a little fancier. The point of the old-fashioned is to avoid adding too much to it so you can allow the whiskey to shine. The best old-fashioned drinks are simple and because of that, it's important to pay close attention to each element. Did you notice that the recipe does not call for a muddled orange? Muddling the fruit with the sugar and bitters is another modern twist, though the earliest old-fashioneds barely used it as a garnish. If you prefer, follow the lead of some bartenders and muddle a whole orange slice with the bitters-soaked sugar cube. You will find others who muddle the orange peel and still others who pair a lemon peel with certain whiskeys. It's all a matter of personal choice. Should you choose not to muddle the peel, express it over the drink before dropping it into the glass. To do this, simply twist up the peel and give it a good squeeze (directed toward the glass and not your eyes) and bits of citrus oils will spray into the drink. The story of the old-fashioned is something modern drinkers can relate to. This cocktail sparked the same debates in the late 19th-century bar scene that modern "martini" menus bring up today. It's actually funny to think that the old-fashioned was "old-fashioned" over a hundred years ago, but it's true. It was around the 1880s and 90's that the American cocktail scene really got going. Drinks were being created with curacao, absinthe, syrups, and fruit juices and they were a hit. There were, of course, the holdouts, those nostalgic drinkers who wanted a simple drink with a kick like they got in the "old days." All of this fancy stuff was a waste of time. Editorials were written in newspapers, arguments were raised in bars around the country, and soon the old-fashioned got its official name. It was first published under the name of Theodore Proulx's (of Chicago's famous Chapin and Gore saloon) 1888 "Bartenders Manual." For decades, the story of the old-fashioned said that it was created in 1881 at the Pendennis Club in Louisville, Kentucky. David Wondrich points out in "Imbibe!" that this is false. The club did not open until 1881 and a year before that, "old-fashioned cocktails" were mentioned in the pages of the Chicago Tribune. There was even an "ambiguous newspaper squib" that mentioned old-fashioned drinks as early as 1869. In truth, the old-fashioned formula dates back to the 1850s, if not earlier. It could be made with whiskey, brandy, or gin (Old Tom or Holland). It was, quite simply, liquor, sugar (not syrup), and ice. Add bitters and you have the basic definition of a true cocktail. Wondrich's book is filled with interesting tidbits of bar trivia and it's one that every cocktail geek should own. Within the notes on the old-fashioned is a fascinating section about the proper ice to use in the drink. It turns out that ice balls and 2-inch cubes are nothing new; they simply got lost in the American bar until recently. Wondrich references the large cube's use in 1899, "...mixologically ambitious saloons preferred to refrigerate their old-fashioned with ice cut into 'perfect cubes about two inches on a side'." The same theory that we use for adding a chill and slight dilution to a glass of straight whiskey has long been preferred for the old-fashioned. Those fancy ice machines we've come to rely on and their tiny, fast-melting "cubes" ruined it for many years. If you are a devotee to the old-fashioned and have not made the switch to 2-inch ice, you'll find it to be the last step in perfecting this iconic drink. How Strong Is the Old-Fashioned? As you might imagine, the old-fashioned is not much lighter than a straight pour of whiskey. Essentially, we just need to factor in a little dilution. When we do, an old-fashioned with an 80-proof whiskey would be around 32 percent ABV (64 proof). Those old-timers would be happy to know that it still has that kick they were looking for. Have You Tried These 10 Essential Whiskey Cocktails?